"At about 3pm on the wednesday 11th, January, 2012, my circulation manager was invited for questioning at the nnamdi azikwe international airport by the sss and his picture was taken. He later started receiving threat call from the sss operatives including the OC in charge of the airport. 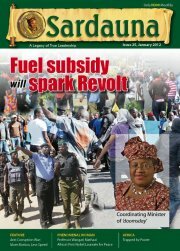 He was questioned concerning the latest sardauna magazine edition titled "Fuel Subsidy will spark revolt". He was asked to go and the magazine was realised. They later followed him to our office and rearrested him and took away the batch of the magazine in our office after they couldn't find me in the office. I had to go to the headquarters and was taken in for questioning. I was asked who was sponsoring me and if the aim was to destabilise the government. I refused to answer their questions and instead insist that they release my staff. Some of the magazines were carted away. I was released after two and half hours because they found out that the press had been notified of my arrest. We need to tell the world that their is no press freedom in nigeria despite the FOI bill."